The parish of Gresham is situated in northeast Norfolk, a few miles south of the coastal parish of Sheringham. Its name comes from the Old English for ‘Grassy homestead’. The parish has a long history of human occupation, and was certainly well established by the time of the Norman Conquest, its population, land ownership and productive resources being recorded in the Domesday Book of 1086. The earliest evidence of human activity in the parish consists of Palaeolithic flint tools, the oldest of which is a Lower Palaeolithic handaxe (NHER 6600). Other finds of this period are handaxes (NHER 6601, 6602 and 6603) and flakes (NHER 6563 and 32893). There is only one flint microlith from the Mesolithic (NHER 6602), but the Neolithic sees a positive explosion in finds, and presumably activity in the area. Numerous flint axeheads have been found, both polished (examples are NHER 6602, 6610, 6563, 6653 and 29593) and chipped (examples are NHER 6609, 6563, 6613, 6614 and 6654). Other Neolithic flint tools found in the parish include chisels (NHER 6608 and 6615), knives (NHER 6615 and 6656) and adzes (NHER (NHER 6563). The Bronze Age in Gresham has left tentative evidence of its first structures. These are the remains of circular burial mounds or round barrows. They have since been flattened by cultivation, but their surrounding ditches are often visible as cropmarks from the air. There are two such sites in the parish, NHER 18098 and 36437. 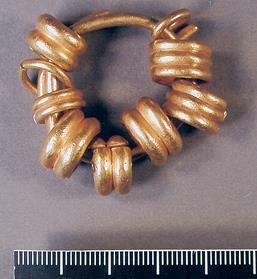 Bronze Age artefacts found include a copper alloy axehead (NHER 35441), a Middle Bronze Age chisel (NHER 35443), an early Bronze Age pottery vessel (NHER 6603), pottery fragments (NHER 17395), and a recently discovered collection of nine gold rings threaded onto a larger ring (NHER 43133). It is not uncommon for the Iron Age to leave little or no trace of its passing, and in Gresham it is true to type, the only find from the period being a gold coin (NHER 33926). The ensuing period of Roman occupation, while not leaving any evidence of settlements or structures, is a little more productive in terms of finds. Objects recovered so far include coins (NHER 17395, 17999, 29814, 31180 and others), pottery fragments (NHER 17395, 17999 and 19517), brooches (NHER 33102 and 33822) and parts of quernstones (NHER 6618 and 17999). Saxon finds to date in the parish are an early Saxon brooch (NHER 35441), a Late Saxon imported brooch (NHER 31501), pottery fragments (NHER 6619) and a Late Saxon box or stirrup mount (NHER 33101). The medieval period has left the parish with its oldest surviving buildings, the churches of All Saints (NHER 6617) in the village of Gresham itself, and St Peter’s (NHER 6639) in North Barningham to the southwest. All Saints, set on a slight hillside to the north of the village, is an interesting round - towered church, the west wall and tower base having 11th century origins. The rest of the tower was put up in the 12th century and the rest of the church added to and altered over the next three centuries, including the addition of the south porch, slightly more elaborate than the rest of the building. The 19th century saw the addition of a north vestry, and then a typically enthusiastic late Victorian restoration that included putting battlements on the top of the tower. Inside is a very fine decorated 15th century font, some good medieval tomb slabs and a rather poignant memorial to three sons of the Batt family, all killed during World War Two. The earliest parts of St Peter’s Church are the west and south walls of the nave, which are probably 11th century. The chancel is 13th century and the north aisle early 15th century. The tower and north porch were added in the late 15th century, and again, a thorough late Victorian restoration took place in 1893. Inside, together with a fine sedilia and piscina, is a unique tiling and stone inlay pattern in the shape of rose window on the nave floor. However, the most lasting impression is provided by the magnificent monuments to the Palgrave family who lived in nearby North Barningham Hall (NHER 6635). To the south of Gresham village stand the remains of Gresham Castle (NHER 6620). This was built on the site of an earlier castle by Sir Edmund Bacon after he was granted a licence to fortify by the King in 1319. Very similar in shape to nearby Baconsthorpe Castle (NHER 6561), it was forty metres square with rounded corner towers and a surrounding moat. Today, nothing of the castle stands to any great height, and it was completely overgrown until recent limited clearance. Other evidence of medieval settlement does not survive, but may be guessed at by the discovery of concentrations of pottery from the period, and sometimes by cropmarks visible from the air. For example, to the southeast of Gresham village , aerial photography in 1976 showed the cropmarks of a complex of rectangular earthworks, and fieldwalking in the same year recovered medieval pottery and tile fragments from the area (NHER 11331). The site has since been destroyed by ploughing, but medieval pottery still turns up. There have been quite a few medieval small finds in the parish aside from pottery, including coins (NHER 15059, 33806 and 33821), part of a dog leash (NHER 29814) a key (NHER 35441) and a Papal Bulla made into a seal matrix (NHER 33821), thought to be unique. Of the surviving post medieval buildings in the parish, probably the oldest is 54 Lower Gresham (NHER 12335), which although much altered and added to, now having a modern shop, was originally 16th century with elaborate woodwork. North Barningham Hall (NHER 6635) is the remaining wing of a large H shaped 17th century mansion, home originally to the Palgrave family and standing on the site of an earlier moated building. It is thought to have been restored recently after many years in ruins. Outbuildings in the grounds include some of the earliest known foxhound kennels. A water mill (NHER 6638) stood to the east of Gresham, marked on a late 18th century map, but it has now disappeared, though a 19th century miller’s house survives. Manor Farm (NHER 12332) is 19th century, but with an earlier core. There were three windmills in the parish too (NHER 15417, 15821 and 18098), marked on old maps, but no trace of these can be seen today, except for NHER 18098, a Bronze Age barrow upon which a post mill was later placed, leaving a characteristic cross shape, visible from the air. Three lime kilns also appear on old maps (NHER 6602, 15418 and 16683), but with the exception of the last of these, a small portion of which remains built into a wall, no trace can be seen today. Piet Aldridge (NLA), 10 April 2006.